No 1: An die Sterne Sterne, in des Himmels Ferne! Mir aus euren Fernen zu? Also dream up there in space? Also revive a feeling heart? Full of hope and faith! Could you ever lead astray? Schumann’s four songs for double chorus, Op 141, are probably his most notable achievements in the medium. There are two unusual and haunting settings of Zedlitz (Ungewisses Licht and Zuversicht), and a mighty version of Goethe’s Talismane that the composer had set as a solo song in the Myrthen cycle. But it is this noble and lofty setting of An die Sterne which opens the opus and which is the jewel of the collection. It is a worthy companion to that beautiful starlit solo song for tenor which Schumann wrote to another Rückert text, Mein schöner Stern from the Minnespiel cycle. Schumann had already composed a motet for double male voice choir to a Rückert text (Verzweifle nicht im Schmerzenstal), Op 93. That had already displayed considerable ingenuity in his deployment of eight vocal parts (although one suspects that Schumann always struggled, as with the medium of the string quartet, to free himself from the left hand / right hand layout which is the sign of a composer who has been a lifelong pianist). In An die Sterne the addition of women’s voices adds a new radiance to Schumann’s writing for larger choral forces; the chordal spacing between the parts, and the distance between the vocal lines of male and female singers, particularly when the two choirs sing antiphonally, give the impression of singing under a heavenly, iridescent cupola. On first hearing, the female voices seem to be conceived as the shining heavenly paragons, the males as the aspiring earthbound observers – another version of Schumann’s reverence for the ewige Weibliche as exemplified by Clara. In fact, a glance at the score shows that the voices are not divided in this way; there are two choirs with a mixture of SATB in each. Although it is true to say that the sopranos of the first choir are stars slightly more highly-placed than their sisters in the second, the dialogue is not organised on sexist lines. There is a real spiritual quality in this musical conversation (as if between opposite earthly poles) reminiscent of Schubert when depicting natural beauty in all its unfathomable glory. The music is shaped like a rondo with returns to the refrain of ‘Sterne’, an address which is reverentially shared in alternation between the two choirs. The harmonic world is as fluid and rich as the Milky Way. This chromatic meandering is not Schubertian; it belongs to a much younger and more experimental generation. The home key of G major is almost immediately invaded by an F natural which pulls the music into the plagal key of C major, a shift which prompts associations of the celestially reverberant acoustic of church music. Amidst various harmonic journeys, the image of the ‘Geisteraugen’ is interpreted with a shuddering harmonic dislocation, while later in the song the twin ideas of ‘Entzücken, Wonne’ are subjected to various tricks of emphasis and augmentation. The last time we hear the imploring words ‘Sterne, Sterne’ it is in a faster tempo where the music is undermined by doubt. The words ‘hoffend, glaubevoll!’ are first heard in a combination of solo voices in the second choir and then reflected back by the full forces of the first. The momentary vulnerability of hearing individual voices in strands rather than a choir, as if the loners were battling to retain their faith, is most affecting. What had begun as an affirmative song of confidence and faith takes on some of the anguish of Schubert’s Mayrhofer setting Abendstern. The words ‘O, ihr holden schönen / Könnt ihr täuschen wohl?’ enshrine a desperate plea from those who seek confirmation that the stars, as much else in life, are a beguiling as first they seem. This is not the case of course. Rückert’s closing question, as cloaked in the dying fall of Schumann’s music, implies that disappointment and deception are an inevitable part of the human condition; there are no easy answers concerning the afterlife. Heaven is in the here and now, rather than something to be hoped for later. 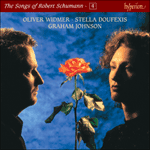 We hear this soft and clear in much of the Schumanns’ Op 37, a Rückert cycle which celebrates earthly love and devotion between husband and wife. The vast canvas of An die Sterne exceeds the parameters of these tender solo songs only in terms of its physical forces. The subtle, intimate world of Der Himmel hat eine Träne geweint from 1841 with its mixture of ardour and humility (the next song we hear on this disc) is somehow absolutely at one with the musical breadth and scope of An die Sterne. Both songs have an inner calm which is more the result of personal grace than of religious conviction. ‘Himmel’ is where the heart is, and one can be suffused with grace at the same time as being tortured by doubt. (This paradox is surely at the heart of the Schumannesque ambivalence.) The magic word uniting these different forms is of course ‘Rückert’; the two works have a similar spaciousness, grandeur and emotional perspective. Schumann was attuned, above all, to the power of verbal imagery and the beauty of words. The link between these two tracks is an illustration of how the work of an individual poet, if it has penetrated deeply enough in a composer’s mind, not only bridges all sorts of musical styles and forces, but also defines something of that composer’s very personality and his view of the world. When we read the texts of An die Sterne, or Der Himmel hat eine Träne geweint we imagine, in the mind’s eye, dear Robert Schumann, silently absorbed in his well-thumbed Rückert (he must have initially owned an edition from the 1830s, but his copy of the 1843 edition, in three volumes, is still to be seen in the museum at Zwickau). What we hear, however, is someone looking heavenwards with such rapture that we have no choice but to follow his gaze and share his vision. Sterne, in des Himmels Ferne! daß sie Frieden hauchen in’s umwölkte Herz! jenseit unsrer Sonne auch ein fühlend Herz! ungetrübter Frieden in die Seele thau’n! hang’ an euch mein Sehnen, hoffend, glaubevoll! to breathe peace into the troubled heart! also dreamed in your domain? sadness and pain up beyond our sun to you? Stars in the distant heavens! distant signs of heavenly peace? warm the weary soul in paradise? until then my hopeful, faithful longing clings to you. brausender Wald, nichts hemmet den Fuß! sternlose Nacht, nichts hemmet den Fuß! Endlich, ha! endlich schimmert’s von fern! ist es ein Irrlicht, ist es ein Stern? wie er mich locket, wie er mir winkt! Rascher durcheilet der Wandrer die Nacht! hin nach dem Lichte zieht’s ihn mit Macht! Sprecht wie, sind’s Flammen, ist’s Morgenroth? Ist es die Liebe, ist es der Tod? a starless night, nothing halts his stride! At last, at last, a distant light glimmers! Is it a will o’ the wisp. Is it a star? how it entices and beckons me! Is it fire or the light of dawn? Is it love, is it death? sich bald dein tiefster Schmerz. wenn dir die Liebe bleibt! will soon turn to delight. when love remains to you? No 4: Talismane Gottes ist der Orient! gib du meinem Weg die Richte! and south rest in his tranquil keeping. is justice for all men. yet you can lead me home.